At the same time it will help promote this 2012 website on Google. Welcome to the End Of The World 2012 Blog. When you first subscribe, you will receive all past blogs in your inbox. Delete them straight away if you don't want to read or keep them all. But please keep the new Folder which is created in your In-Box. By doing this, each new blog will arrive fresh in this folder the moment it is posted! You can delete the new blog when you've read it but please keep the folder so you can continiue to support our website. 2012 Solar Flares Concern - Is there a problem? What is a Pole Shift? What causes it? Are we in danger? There are two main theories. Is Nibiru Coming in 2012? Will a planet called Nibiru bring about the end of the world on December 21, 2012? Let's start by looking at where this idea of the world being destroyed by a planet came from. 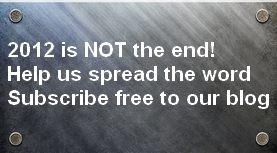 This blog looks at three December 21, 2012 doomsday ideas. I'll try and keep it simple otherwise I won't understand what I'm talking about. 1. 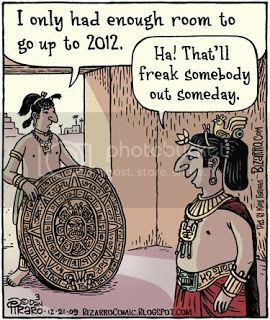 What is the Mayan Calendar 2012 doomsday prophecy? Some end of the world conspiracy theories suggest that governments are hiding information about an impending 2012 doomsday; a worldwide cataclysm of biblical proportions that would bring about death and destruction on a global scale! Is this right? Is there a 2012 doomsday government conspiracy? I-Ching, 2012, Time Wave Zero, end of the world! I-Ching, known as the Book of Changes, has in it a system of divination thought by some to be the oldest system of divination. In more recent times, the I-Ching has been interpreted as a system of cosmology (study of universe, time and space) and of philosophy (love for and pursuit of wisdom). Many people all over the world in places like Australia, Hungary, Russia, the Czech Republic, Costa Rica and the UK have reported strange eirie sounds that some have been referred to as "The Sound of the Apocalpyse". From mid 2011 through 2012 there has been an increase in reporting of these strange sounds. I've been thinking, which can sometimes get me into trouble, that we should be planning a party for December 21, 2012. Or should that be December 22, 2012. What do you think?